What is a twill shirt? - Here is a detailed answer with images. What is a twill shirt? A twill shirt is a shirt with a twill weave. So a twill cotton shirt is a shirt where the cotton has a twill weave. Twill is not a type of material or fabric, but a description of the weave of the fabric. More detail on twill shirts and the differences between twill and poplin is below. What is a twill shirt weave? A common style for a twill weave shirts is two over and then two under, with an offset between the rows. This creates the distinctive parallel diagonal patterns you see in the weave of twill shirts. 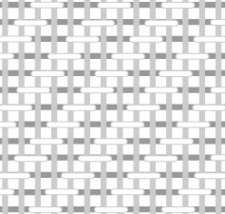 The black and white pattern image below gives an example of a twill weave. In the diagram above the parts where the threads are shown in white are the threads which are raised. Twill weave is often used for jeans and if you look at a typical pair of jeans you will see diagonal ridges which are the result of the twill weave. If the lines run to the right then that is known as the Z direction. Twill weaves are also a grouping which covers other different kinds of weaves like herringbone, chevron and houndstooth. Herringbone is a type of broken twill where the twill reverses directions at regular intervals. Twill shirts are typically heavier than poplin shirts and therefore will keep you warmer. This makes them better for colder weather. Another advantage of twill shirts is that the heavier weave makes them easier to iron than shirts which are poplin weave. All of the major shirt retailers including Charles Tyrwhitt, Thomas Pink and TM Lewin sell twill shirts. Head to their websites and type “twill” into the search boxes. If you want to understand more about poplin shirts then see the what is poplin page and if you want to understand more about Oxford shirts then see the what is an oxford shirt page.